The Solihull Medical Cosmetic Clinic sees and treats approximately 200 clients a year for dark circles around eyes and offers a complete range of treatments to address dark circles under eyes. Some of the treatments carried out may be advised to use alone or in combination depending upon the cause. Dr. Sagoo will assess each client before suggesting a treatment protocol. Dark circles under eyes are a common problem, especially amongst Asians and black people, and can be embarrassing in public. Understanding the causes of dark circles allows us to be able to treat the underlying cause. 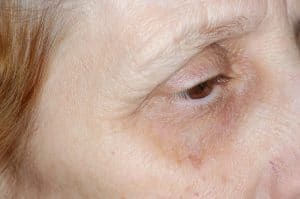 Skin conditions like atopic eczema have been known to cause dark under-eye circles. The cause can also be from aging since the skin loses collagen and thins, making veins more prominent. The dark circles can also be caused by your facial features. Shadows can be cast by bone structure, puffy eyelids or from hollows under the eyes caused by the natural process of aging. Dark circles, also known as periorbital circles, periorbital hyper pigmentation or periorbital melanosisis are dark blemishes around the eyes. They may or may not be associated with under eye puffiness, bags, malar festoons etc. he Blue circles are formed due to pooling of oxygenated blood in under-eye skin. As skin on this part is very thin, so blood shows through. However brown/black dark circles are most commonly found. They are due to hyperpigmentation of the skin around the eye. The dark circles can be caused by seasonal allergies such as hay fever, food allergies, cosmetic allergies and allergens in the home or workplace. Allergies cause inflammation which enlarges the tiny blood vessels beneath the eyes. 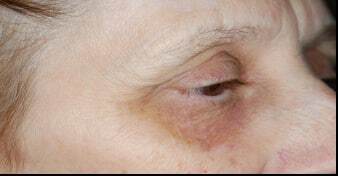 These swollen blood vessels press against the thin under-eye skin and the dark colour shows through. The rubbing and scratching can also stimulate melanocyctes (melanin-producing cells) darkening pigmentation in the area. Poor nutrition can lead to vitamin deficiencies, specifically B vitamins (such as a B12 deficiency from anaemia), vitamin E, vitamin C and vitamin K and can result in dark circles. Vitamins are also needed for adrenal gland function. When the adrenal gland is fatigued from stress, excess consumption of caffeine, alcohol and sugar, vitamin absorption is impaired, resulting in facial puffiness and dark circles. Lack of water causes dehydration, which causes blood vessels to become dilated and swollen. Also avoid too much alcohol and caffeine which can dehydrate the body, as well as disrupt sleep. Alcohol also decreases the flow of oxygen to the skin, as does smoking. In addition to possibly causing anaemia, your monthly cycle can cause hormonal-induced dark circles and puffiness due to water retention and PMS. Cut down on salty foods, carbohydrates and excess fluids. Other hormonal changes (pregnancy, menopause) can also cause blood vessels to swell. Tear trough deformity is usually commonly inherited over time due to the normal loss of tissue under the orbital rim area. In the event that a tear trough deformity exists, a temporary filling agent such as Restylane or Juvederm can be placed in the valley to plump up the depression, which improves the appearance of the dark circles. The treatment is not painful, and it is a one-time procedure performed after a small amount of numbing cream has been applied to the skin. The Solihull Medical Cosmetic Clinic under the supervision of Dr. Sagoo provides a range of cosmetic treatments to improve appearance of under eye dark circles. Using high intensity light, a wavelength that is absorbed by the brown pigment in dark skin, the dark colouration under the eye can be improved over a series of three to four sessions. There is no down time although using high factor sun block is recommended. 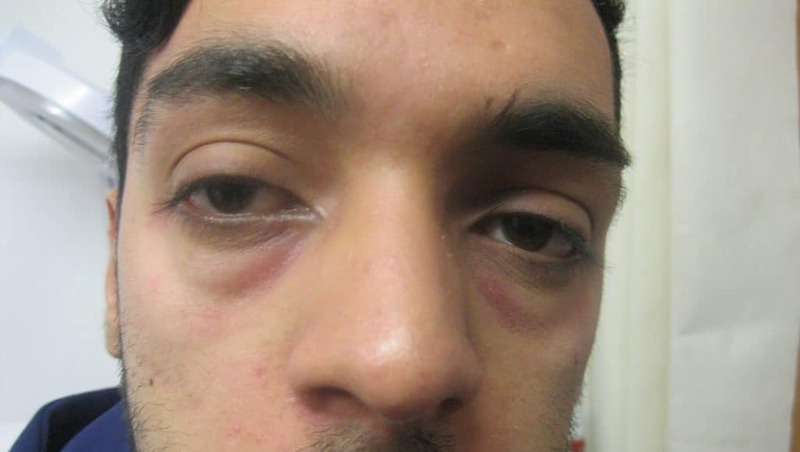 This is a new technique offered by the Solihull Medical Cosmetic Clinic which targets the build up of “venous pooling” under the eye area. Using carbon dioxide gas the treatment helps to address this problem. The capillary network of the lower eyelids can become congested for a variety of reasons. Normally, the tears drain from the eyelids into the nose, but if there is some obstruction due to chronic nasal congestion from seasonal allergies or a nasal fracture, the drainage does not function well, and the blood flow to the lower eyelids slows down, leading to a blue tinge under the eye. The lack of appropriate oxygenation to the lower eyelid skin leads to a bluish colour to show through the thin skin of the eyelids. 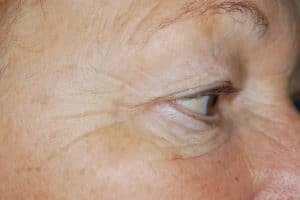 Carboxytherapy works to improve the capillary network of the lower eyelids, as well as to increase the dermal collagen layer in the lower eyelid skin. By injecting a small amount of carbon dioxide gas into the affected areas, blood flow is increased and improved capillary networks are formed for longer lasting circulatory benefit. The bluish colour is replaced with a healthy pink tone. A series of four to six sessions is recommended, with maintenance 6 monthly, skin has a more luminous appearance and is safe on all skin types. In addition home skin lightening creams are also prescribed to improve the colouration. In the event that a tear trough deformity exists, a temporary filling agent such as Restylane can be placed in the valley to help plump up the depression, which may improve the appearance of the dark circles. The treatment is not painful, and it is a one-time procedure performed after a small amount of numbing cream has been applied to the skin. The results may give an immediate lifting under the eye to improve hollows and instantly take years off tired looking eyes. Dr. Sagoo has treated hundreds of clients with this procedure as it is a skilled advanced treatment and needs to be done carefully and can give dramatic improvements. Glycolic peels and homecare solutions. Glycolic peels break apart the dead cell layer and bring fresher skin to the surface, which may reduce pigmentation around the eyes as well as improve skin texture. 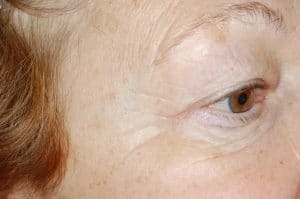 Using a CO2 laser under eyes in white skinned individuals, may help remove increased pigmentation by peeling the skin after a “controlled burn” to the skin. This may also improve fine lines, wrinkles and texture. Under eye muscle relaxing injections is advised if there are wrinkles and fine lines under the eyes, causing the darkening. 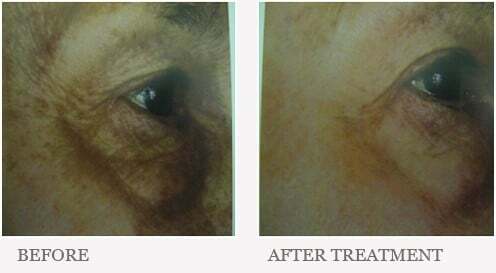 The eye peel is highly effective and reduces excessive pigmentation production in the skin safely. The products natural-based ingredients build up in the skin over a number of weeks, resulting in a gradual slowing down in melanin production and normalising excessive levels. As a result, new lighter skin cells migrate to the skin surface, replacing older, darker skin through natural shedding which is encouraged by a mild exfoliant. The eye peel utilises a combination of 4 ingredients to target 4 different stages of pigmentation manufacture while not damaging the melanocyte (the cells which make pigment) and also not releasing potential carcinogens. The eye peel does not contain hydroquinone, yet it is just as effective and eliminates the risks associated with this dangerous ingredient. It targets all types of hyper pigmentation. Ascorbic and Lactic acid suppress melanocyte activity. LC has 4 synergistic active ingredients comparable to 4% hydroquinone, but contains no hydroquinone or derivatives. The areas of the face which show our age the most are the peri-ocular (around the eyes) and peri-orbital areas (around the lips). The eye peel is a gel-based skin remodelling solution that is especially designed for these sensitive areas because the combination of the two acids in a gel, where you can increase the concentration gradually by layering the product, allows one to achieve similar results as you would with a high strength acid, thus limiting and controlling any irritation and reddening of these sensitive areas. Four Eye peels (7-21 days apart) Exposure time 1-2 minutes per layer up to four layers. Dark Eye peel is a gel-based skin remodeling solution especially designed to target around the eye It targets Fine Lines close to the eye, Crows Feet – which we all know and hate, pigmentation build up below and eye or on the eye lid, it is a non invasive and trouble free treatment has little to no downtime, which essentially means you are free to carry on with your daily routine without having to hide away. Dark Eye peel is a chemical peel and much more. It works different to the other chemical peels out there. The technology is a new, patented carrier solution which restrains the acids activity until it is absorbed fully into the skin, thereby focusing on remodeling from inside the skin. This is not buffering the acid and thereby reducing its activity; it is restraining it and then releasing it to accelerate through the skin, enhancing its activity. Dark eye skin peels don’t peel they remodel by delivering treatment ingredients deep into the skin, remodelling without excessive exfoliation and surface trauma. The Dark eye peel emphasis is on remodelling, restructuring, rejuvenating, reducing sun and age damage and controlling skin conditions such as acne, rosacea, thread veins, pigmentation, skin tightening and rejuvenation with minimal downtime ensuring you can carry on with life as normal. Patients also report a tightening affect from the peels as well as feeling rejuvenated around the eye area. The clinic provides a range of skin lightening creams such as Arbutin and Kojic acid, as well as Vitamin A retoinoid creams, collagen stimulating and skin rejuvenation creams to help keep the skin healthy looking. How can dark circles be prevented? What must one remember whilst undergoing these treatments? 1) None of the treatments is effective on its own and there is always a need for combined approaches to the management of dark circles. 2) Most effective treatment occurs when the underlying cause is determined. 3) Every skin is different, just like every individual is unique. 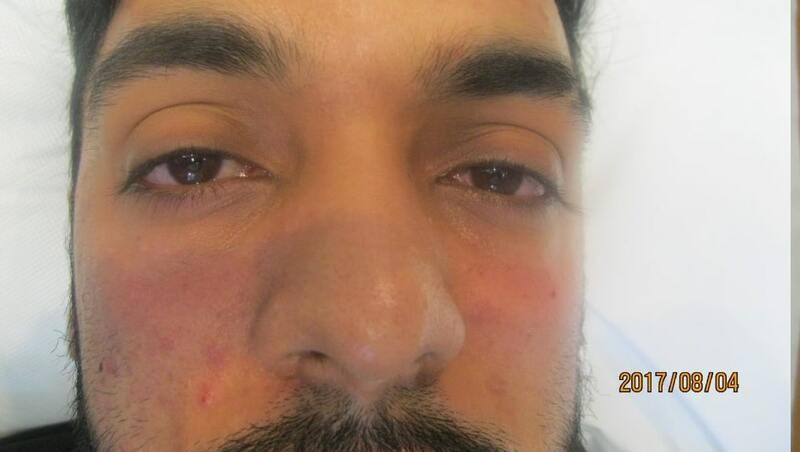 4) Dr Sagoo is a trained expert with ample years of experience for treating under eye dark circles. Cost of dark circles treatment? Stressful lifestyles, environmental pollution and sun exposure may cause unsightly dark circles which mar your face and dull your eyes’ sparkle. 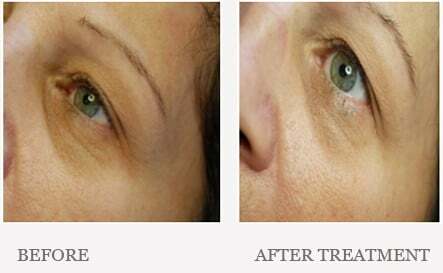 Dark circle treatment is one such treatment that can lighten or eliminate dark circles. The cost of dark circle treatment varies from person to person, and the number of treatments that you will need to lighten your under-eye area. However, since your eyes are very delicate, you should not decide where to undergo treatment on the basis of cost alone. Choose a reputed cosmetic doctor and clinic to undergo your procedure. Improving our appearance is a goal that we all tend to have. At The Solihull Medical Cosmetic Clinic, we have helped many patients undergo treatments that make them feel younger. For further information and a free consultation with Dr Sagoo please call us on 0845 603 6150.